Rapid Eyewear's aviation sunglasses range (previously called 'MileHigh') are the world's leading polycarbonate and TR90 based sunglassesdesigned with pilots in mind. Each pair comes with four sets ofinterchangeable lenses for different light conditions: please note thatin line with CAA recommendations, none of the lenses are polarised. All of Rapid Eyewear's pilot sunglasses are manufactured to the high standards, with lightweight, wrap-around frames that fit comfortablyunder headsets. They offer 100% UVA and UVB protection and comply withISO 12312 and US Z80.3 standards. 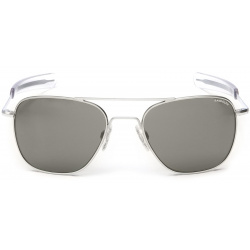 Cruise pilot sunglasses feature lenses that have been specificallydesigned and manufactured for aviation purposes, with interchangeablelenses for different light conditions. Cruise also feature alight weight yet strong TR90 frame, which has flat side arms that sitcomfortably beneath a headset. The Cruise sunglasses have a wrap-around design that blocks unwantedlight (and wind) from the peripheries of your vision. In line with CAArecommendations, they are not polarised, thereby ensuring you can readinstruments whilst wearing these sunglasses. All lenses benefit from an anti-scratch coating,and the de-centering process, which calibrates out the potentialdistorting effects of placing a curved lens in front of your eyes. The category 0 lens set features an anti glare coating on the rearsurface, which effectively removes glare from street and buildinglights etc. in the dark. 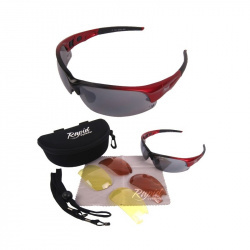 Rapid Eyewear sunglasses conform to ISO 12311and 12312 standards for sunglasses and protective equipment testing.They offer 100% UVA / UVB (UV400) protection and comply with US Z80.3. All sunglasses come with 4 x sets of lenses asstandard, a cleaning cloth and a carry case with belt clip and internalcompartments for housing the extra lenses. Polarised lenses reduce glare, making them excellent for general sports & leisure use. Please note these lenses must not be used for flying as they do not meet CAA recommendations, due to the fact it is difficult to read digital instruments with such lenses fitted. The blue Frostech lens, finished in an attractive blue mirror finish, is fine for flying and makes a colourful alternative to the grey lens. It has vent cut-outs that prevent fogging on a hot day and a mirror finish. With their modern styling, unique specifications and conformity to CAA recommendations, the UV400 Edge Pilot Sunglasses for Men & Women further enhance Rapid Eyewear's classic 'Mile High' range. Grey category 3 lenses can be swapped with two further options to cover all light conditions. The frames feature a wrap-around shape, which prevents the intrusion of unwanted wind and light from the peripheries of your vision. Edge are available in three attractive colours: matt black, blue and red. Edge MH are supplied with a carry case, retainer strap and microfibre cleaning cloth as standard. All Rapid Eyewear sunglasses comply with ISO 12312 and US Z80.3 regulations. As such, they offer 100% UVA / UVB (UV400) protection. They also comply with all Civil Aviation Authority recommendations for pilot sunglasses. The extra lenses are available for the Edge frame. Please note that polarised lenses must not be used for flying. 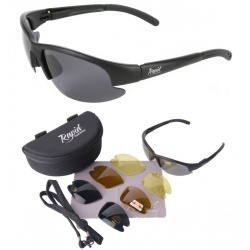 Rapid Eyewear's The world's leading sunglasses exclusively designed and manufactured for RC model flying use. 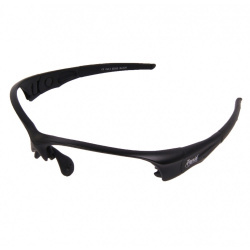 The Modelglasses range has been the market leader since 2005: as used by many of the world's top RC pilots. Designed by experienced modellers, Model Glasses are an essential RC accessory. Featuring interchangeable lenses, they offer low light and polarised options that improve depth perception, contrast and the definition of clouds and models during flight, whatever the conditions. Each pair of Modelglasses is supplied with interchangeable lenses, a carry case, a cleaning cloth and a head retainer strap. Additional lens options are also available on each product page. Nimbus sunglasses have been an integral part of Rapid Eyewear's RC Modelglasses range for several years, and they remain as popular as ever. The choice of many top pilots across the world. They feature interchangeable lenses, including polarised and low light options, that will make Nimbus invaluable whatever the conditions. Nimbus benefit from a lightweight TR90 frame with sprung side arms, rubber nose pads and rubber side arm extensions for comfort fit. The frame has a slight built-in flex that allows for fitting on most sizes and shapes of head. Finished in a hand sprayed matt black finish. All lenses have an anti-scratch coating and precision decentred optics. The lenses filter out blue light to improve contrast and definition in your field of view, thereby helping to determine the distance to, and orientation of, a model. A pair of attractive Frostech blue mirror lenses is available as an optional extra. Rapid Eyewear sunglasses conform to ISO 12311 and 12312 standards for sunglasses and protective equipment testing. They offer 100% UVA / UVB (UV400) protection and comply with US Z80.3. Edge sunglasses for RC have innovative side arms that can be rotated up and down on a ratchet system, to ensure a perfect fit on your head. 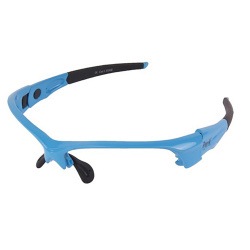 With an adjustable nose clip, attractive vented blue or red Frostech mirror lenses and a stylish new look, Edge Modelglasses are ideal for flying RC model aircraft. Made from polycarbonate and finished in an attractive matt black, light blue or red, the Edge frame is so comfortable and light that you will probably forget you’re wearing them. Side arm rubber extensions, an adjustable nose clip and the rotating side arms allow for a bespoke fit for your needs. Category 4, dark smoked for very bright conditions (please note this lens set cannot be used for driving). * Polarised lenses filter horizontal light that bounces off flat surfaces to cause glare. Please note you may not be able to read a transmitter display whilst using polarized lenses. All lenses feature cut-outs that help air to flow across the rear surfaces, thereby reducing fogging. They are decentred, and have anti-scratch coatings applied. Edge are supplied with a carry case, microfibre cleaning cloth and retainer strap as standard. Edge comply with ISO 12312 and US Z80.3 standards. They offer 100% UVA / UVB (UV400) protection. The extra lenses are available. 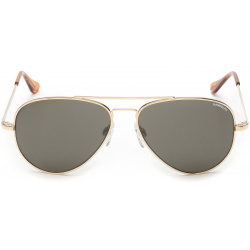 A replacement or spare matt black frame for all Edge sunglasses packages. 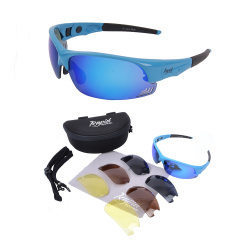 A replacement or spare blue frame for all Edge sunglasses packages. 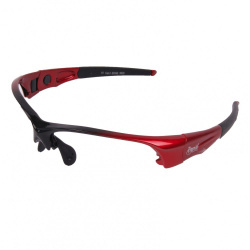 A replacement or spare red frame for all Edge sunglasses packages. A blue mirror lens set that looks attractive, and packs a punch in terms of specifications. 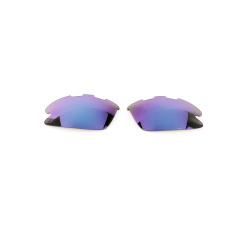 The Frostech lenses feature a mirror coating that provides an anti-glare capability, and vent cut-outs that allow your eyebrows to breathe, thereby preventing fogging and sweat patches from forming on the rear surfaces. The Category 3 light treatment of the Ft lens means it is perfect for use in normal, sunny conditions. It offers 100% UVA / UVB protection, and has an anti-scratch coating. The Frostech lens set is ideal for general sports and leisure use. The vented lenses make this set especially good for skiing, climbing, driving, running, tennis and cricket. 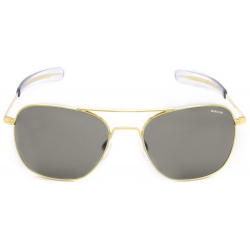 Polarised lenses make the perfect addition for those with Mile High Cruise sunglasses who want to add a strong anti-glare capability to their package for those times when they are not in the air. Polarised lenses cut glare by filtering out horizontal sunlight, which bounces off flat surfaces. The Category 3 light treatment means this set is ideal for use in regular, sunny conditions. As with all Rapid Eyewear lenses, the Cat 3's offer 100% UVA / UVB protection. 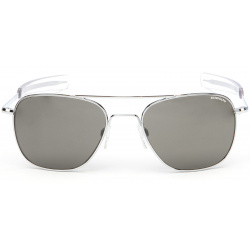 Please note that polarised lenses are not CAA approved, because they can make it difficult to read digital instrumentation in an aircraft cockpit, or when paragliding etc. This set is suitable for all sports and leisure activities 'on the ground', including driving, cycling, golf, running etc. The Category 3 light treatment of the Frostech lens means it is perfect for use in normal, sunny conditions. It offers 100% UVA / UVB protection, and has an anti-scratch coating. 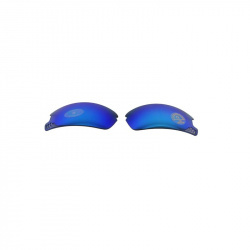 A replacement or spare category 3 Blue Frostech lens set for all Edge sunglasses packages. These lenses can also be purchased as an extra pair for Edge Black and Edge Red packages (which have the red Frostech lenses as standard).